There's five days to go to the Seaford half-marathon, and I ran down to Seaford front, in one direction to Splash Point, and in the other to the sailing club. I was pleasantly surprised to be quite fast, as I still have a cold, and haven;'t run since an outing on Friday round Stanmer Park with Claire. The warm weather having returned, I celebrated in Claire's company with a reprise of the University of Sussex boundary run. I forgot to start the Forerunner so cannot offer any interesting statistics. I had a cold yesterday which prevented me from doing a Sunday run, so I compensated with a damp Monday lunchtime run round the health week route. Nature notes: calves, rabbits and peacocks. I haven't done anything very strenuous since the boundary run. Last Friday, I had a short run round Stanmer Park with Claire, Chris and Joanna, on Wednesday the same with Claire, Jana and Joanna and again today with Claire and Jana. I haven't kept statistics for the earlier runs but today I added an extra couple of miles at the end so perhaps it is worth recording. It might be called perverse folly to choose a race for one's first post-marathon run, but as today was the University of Sussex's Boundary fun run (NB word file), I couldn't resist entering, and I decided that I should still be race-fit. I think I did fairly well considering. First, statistics: I was 90th out of 167 finishers, 12th in my age group, in an official time of 4:17:33. In sixteen weeks of training I ran 522.61 miles. So I failed to run a marathon in less than four hours, but remain convinced that I could, perhaps on an easier surface. The marathon started in overcast weather; at Avebury, I saw the stone circle for the first time (see John Aubrey’s description), and it drizzled a little as I was changing in the churchyard. The knee trouble I’d had persisted, indeed when I’d got up that morning was quite bad, but I put on a sports bandage, which seemed to do the trick. 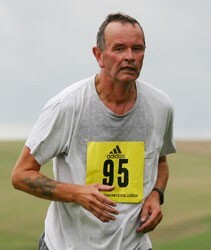 I ran my sixth marathon yesterday, the Neolithic, from Avebury to Stonehenge. A full account will follow. Off I go at 1 today for the Neolithic Marathon, train to Salisbury, and then I'm staying in a hotel in Amesbury. I think I'm ready. By this time tomorrow I and around 300 others will be at the 5-6 mile point. I will supply a full account on my return. I had a gorgeously sunny run in Stanmer Park today with Claire and Jana, though my knee was a little sore, but I think a few days rest before the marathon will sort it out. For my last Tuesday early speed run, I ran six 400m fast sessions on a beautiful bright morning along Seaford front, with 100m recoveries and 1 mile warm-up and cool-down.